Good morning! I have another Peachy Keen Challenge coming your way, and this week, we have a sketch with a twist. I LOVE sketches, and this one was designed by our very own Viv. I REALLY had fun with this, and the twist on this sketch is to do a monochromatic color scheme. I was so anxious to ink up this adorable Pk-282 St. Patrick's Day stamp set from Peachy Keen Stamps, that I kinda spaced about the monochromatic thing. Thankfully, my shamrock paper saved me, because there's a whole bunch of shades of green there. I colored this with Copics, but I'm not at all happy with my little fella's beard. I went too dark with my red tones, and couldn't get the dimension I wanted after going so dark. That happens sometimes when using darker colors, so you see, we ALL make mistakes we're not happy with, and I've just shared one of my oopsies with you. I heat embossed the Pot O Gold with gold embossing powder, and I love that the gold coins, punched from metallic gold card stock work as one of the elements in this sketch. The stars were punched with SU star punches out of like colored card stock, inked with Versamark, and sprinkled with heat and stick powder. Once the heat and stick powder is melted and REALLY sticky, then a good dousing of gold and green glitter were applied. This is a great way to sparkle things up, but once you heat set it after you've applied the glitter, it doesn't fall off everywhere. Heat and stick powder is a wonderful thing, and I get mine from Stampin' Up!. I finished this card off with some gold cord behind my leprechaun, and some green rhinestones down the side of the large panel. That pretty much does it for this card! 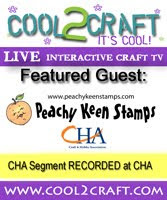 Be sure to check out the Peachy Keen Stamps Challenge Blog to see all the wonderful creations from our amazing and talented designers. We have a special guest designer this week, too!! Erika has some amazing creations to share that will amaze and inspire you, so please be sure to visit her blog to let her know how much you love what she's doing with her Peachy Keen Stamps. I sure hope you get the chance to play along with this challenge, because one lucky winner will receive a K&Co. Valentine Design package valued at $20.00. We had LOTS of players for our last challenge, and the cards were ALL wonderful! I can't wait to see what our Peachy Keen fans do with this one!! Thanks for dropping by today! I'm so happy you could join me for a little bit. I hope you leave inspired to do some happy stamping! Have a wonderful day!! lovely card Lorie....love the colouring of his hat! I love your card you are so amazingly talented!! I am beside myself with joy at having a chance to have my card posted along with your and the other amazing creative women from PKS!! Your card is wonderful! I love how you pulled in all the gold. Thanks for the tip about the heat and stick powder. I will have to give it a try sometime. OMG!! Lorie!!! Just LOOK what you went and did with the sketch. Your card is so RICH. The vibrant greens and golds. The leprechaun's beard look wonderful to me and I just can't help staring at the fabulous colouring you do! You did my sketch PROUD! Gorgeous!!!! Even with your guys beard that you aren't happy with, I'd be in heaven if my coloring looked even a fraction this good. You are amazing!!!! I love it! Luck o the Irish! This is adorable. What a wonderful card! The bright colors and shiney bits are perfect for a St. Paddy's Day card! Super awesome job! Love the card! I love the color green... your coloring is always so perfect! I love the details of the rainbow! I love how you did the "Pot of gold" sentiment to! Just love everything!